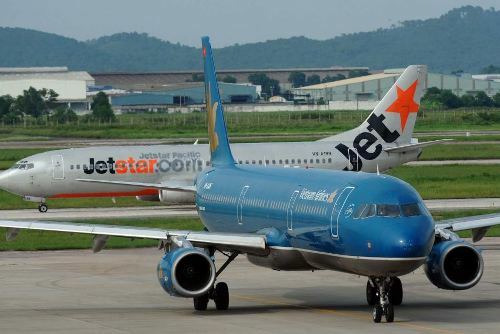 HA NOI (VNS) — Vietnam Airlines (VNA) and Jetstar Pacific have cancelled a total of 27 flights because the Vamco typhoon, the third typhoon this year, has entered the central parts of the country. VNA said it would not release any flights to or from the central city of Da Nang between 2pm and 5pm today to ensure the safety of its passengers. Earlier, VNA had cancelled four flights to and from Buon Ma Thuot City in the Central Highlands Province of Dak Lak and two flights to and from the central province of Quang Nam. Jetstar Pacific said the weather in Buon Ma Thuot City this morning was bad, so a flight travelling from the northern port city of Hai Phong to Buon Ma Thuot City had to land at Tan Son Nhat Airport in HCM City, whereas another flight from HCM City to Buon Ma Thuot City had to come back to the Tan Son Nhat Airport to land. The passengers were given a stipend of VND250,000 (US$11) to help them travel to Buon Ma Thuot City. Other flights will have to change their departure times as well.